The National League for Democracy says its leader has taken a seat in parliament, in spite of allegations of vote-rigging. Supporters of the National League for Democracy gather outside the party headquarters in Yangon to await news from the national by-elections. THE MAIN OPPOSITION party in Burma, the National League for Democracy, says its leader Aung San Suu Kyi has taken a seat in the country’s parliament – allowing the former Nobel laureate to take elected office for the first time. A digital display outside the party’s headquarters in Rangoon, also known as Yangon, said Suu Kyi had taken around 65 per cent of the vote in her district, sparking wild celebrations among supporters outside. “We won! We won!” her supporters chanted while clapping, dancing, waving red party flags and gesturing with thumbs-up and V-for-victory signs. The party had staff and volunteers spread throughout the vast rice-farming district, who were calling in preliminary results by phone to their party headquarters. The results must be confirmed by the official electoral commission, however, which has yet to release any outcome and may not make an official declaration for several days. The NLD’s celebrations were made even more ecstatic by the fact that the party had expressed fears of “rampant irregularities” in the election process – claiming that, in at least 50 cases, voters were given ballot papers with wax smeared over the box beside the NLD’s name. This would mean that ballot papers were difficult to mark or easy to wipe clean, the party said. There were also ballot cards that lacked the Election Commission’s seal, which would render them invalid. Suu Kyi, the general secretary of the party, was only one of the NLD’s candidates seeking to fill 45 vacant seats in the 664-seat national parliament. The by-elections are being held to fill seats left by MPs who were promoted to government offices – the constitutional forbids party membership among government officials, but many are part of the Union Solidarity and Development Party anyway. Even if the victory is confirmed, Suu Kyi and other opposition candidates would have almost no say even if they win all the seats they are contesting – the USDP holds a massive majority in both houses – but their presence in the parliament will be seen as a major boost to the NLD’s quest to oust the ruling military junta and the USDP which many see as a puppet administration. The last elections fought by the NLD were in 1990, when the party won 59 per cent of the vote, entitling it to around 80 per cent of the seats in the larger lower house. On that occasion, however, the ruling junta struck out the result and later banned the party. A confirmed victory by Suu Kyi could also encourage Western powers, and nudge them closer to easing economic sanctions they have imposed on the country for years. 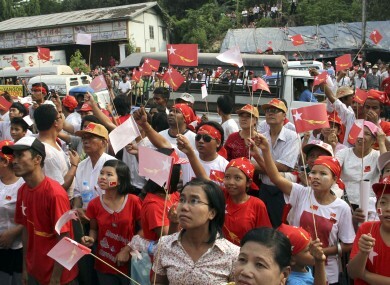 Email “Aung San Suu Kyi claims victory in Burmese by-election”. Feedback on “Aung San Suu Kyi claims victory in Burmese by-election”.